CBI - China: Day 24 of 154 of the Japanese Invasion of Manchuria. Spain: Day 87 of 985 of the Spanish Civil War. Spain: Day 452 of 985 of the Spanish Civil War. CBI - China: Day 97 of 2,987 of the 2nd Sino-Japanese War. Day 60 of 106 of the 2nd Battle of Shanghai. Day 41 of 70 of the Battle of Taiyuan. Spain: Day 817 of 985 of the Spanish Civil War. CBI - China: Day 462 of 2,987 of the 2nd Sino-Japanese War. Day 123 of 139 of the Battle of Wuhan. ETO - France: British Expeditionary Force on continent reaches strength of 158,000 in five weeks. Finland: USSR tries to cut a deal with Finland, allowing them to set up Soviet bases there, but the Finns find their demands are too demanding and reject it. CBI - China: Day 827 of 2,987 of the 2nd Sino-Japanese War. ETO - UK: Day 36 of 258 of the Blitz. ETO - UK: Day 94 of 114 of the Battle of Britain. East Africa: Day 124 of 537 of Italy's East African campaign in the lands south of Egypt. CBI - China: Day 1,193 of 2,987 of the 2nd Sino-Japanese War. Day 332 of 381 of the Battle of South Guangxi. CBI - Thailand: Day 11 of 221 of the Franco-Thai War (Vichy France vs Thailand). Russian Front - Center: Day 10 of 98 of the Battle of Moscow. 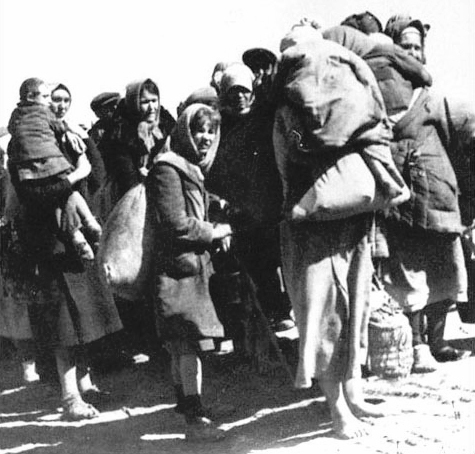 Rumors of the impending capture of Moscow by the German Army cause thousands of civilians to flee the city. Moscow was one of the primary military and political objectives for Axis forces in their invasion of the Soviet Union. Stalled advances on Moscow resumed on 02 Oct 41 with an offensive code-named Typhoon. It was to be the German knockout blow of the campaign. German troops will get to within 19 miles of the Kremlin on 27 Nov 41, but will be too weak by then to take Moscow. Down by 12 runs in the 2nd inning, the all but defeated Red Army continued with fierce determination. And thanks to an arrogant German manager, there would be no joy in Reich-ville. Russian Front - Finland: Day 105 of 142 of Operation SILVER FOX, a joint German-Finnish campaign to capture the Russian port of Murmansk in the Arctic. Russian Front - Finland: Day 103 of 140 of Operation ARCTIC FOX, a joint German-Finnish campaign against Soviet Northern Front defenses at Salla, Finland. Russian Front - Finland: Day 112 of 164 of the Battle of Hanko. The Soviets will be forced off their leased naval base. Russian Front: Day 112 of 167 of Germany's Operation BARBAROSSA. Russian Front - North: Day 34 of 872 of the Siege of Leningrad. Russian Front - South: Day 65 of 70 of the Siege of Odessa, Ukraine. MTO - Libya: Day 185 of 256 of the Siege of Tobruk. East Africa: Day 489 of 537 of Italy's East African campaign in the lands south of Egypt. CBI - China: Day 1,558 of 2,987 of the 2nd Sino-Japanese War. ETO - UK: The first night raid on Britain by the Luftwaffe for 15 days. Russian Front - North: Day 399 of 872 of the Siege of Leningrad. Russian Front - North: Day 160 of 658 of the Siege of the Kholm Pocket, USSR lays siege to the Kholm Pocket but the Germans hold out for a about a year and a half. Russian Front - South: Day 106 of 150 of Germany's CASE BLUE, the failed offensive to take the Caucasus oil fields. Russian Front - South: Day 50 of 165 of the Battle of Stalingrad, bloodiest battle in human history. MTO: US B-24s attack an Axis convoy in the Mediterranean Sea. East Africa: Day 160 of 186 of the Battle of Madagascar. CBI - China: Day 1,923 of 2,987 of the 2nd Sino-Japanese War. PTO - Alaska: Day 127 of 435 of the Battle of Kiska, Aleutian Islands. The US and Canada will defeat the Japanese invaders. PTO - Malaya: Day 235 of 357 of the Battle of Timor Island, a long guerrilla war ending in Japanese victory. PTO - New Guinea: Day 83 of 119 of the Battle of the Kokoda Track. The Australians continue pushing back the Japanese troops. PTO - Solomon Islands: Day 66 of 187 of the Battle of Guadalcanal. PTO - Solomon Islands: Day 1 of 2 of the Naval Battle of Cape Esperance. The US Navy engages a Japanese naval squadron off Savo Island. Russian Front - North: Day 764 of 872 of the Siege of Leningrad. Russian Front - North: Day 525 of 658 of the Siege of the Kholm Pocket. USSR lays siege to the Kholm Pocket but the Germans hold out for a about a year and a half. Russian Front - South: Day 49 of 122 of the Battle of the Lower Dnieper River, USSR. MTO - Greece: US 12th Air Force B-25s bomb Garitsa Airfield while P-38s hit a vessel in the Corfu harbor on Corfu Island. CBI - China: Day 2,288 of 2,987 of the 2nd Sino-Japanese War. PTO - New Guinea: Day 23 of 219 of the Battle of Shaggy Ridge. PTO - New Guinea: Day 20 of 162 of the Battle of the Huon Peninsula. Will result in an Allied victory. ETO - France: Day 72 of 284 of the Battle of Brittany. ETO - Belgium: Day 40 of 62 of the liberation of Belgium. ETO - Belgium: Day 10 of 38 of the Battle of the Scheldt Estuary. ETO - France: Day 27 of 236 of the Siege of Dunkirk. ETO - Netherlands: The RAF completes the flooding of the island Walcheren. The bombs busted the dikes, turning the whole island into a lagoon. ETO - Germany: Day 23 of 145 of the Battle of Hürtgen Forest. Russian Front - Finland: Day 27 of 223 of the Lapland War. Finland and Russia have joined forces to kick the Germans out of Finland's most northern province. Russian Front - Finland: Day 5 of 23 of the Petsamo-Kirkenes Offensive. The Soviets will drive the Germans out of the Arctic region in northern Scandinavia. Russian Front - North: Day 28 of 41 of the Battle of Riga, Latvia. Russian Front - Center: Day 28 of 72 of the Battle into East Prussia and northern Poland. Russian Front - Center: Day 7 of 18 of the Battle of Memel, a border town of Lithuania and East Prussia. Russian Front - South: Day 6 of 24 of the Battle of Debrecen, Hungary. The Soviets capture Klausenburg in Romania as Hungary and the USSR begin negotiations for a ceasefire. Russian Front - South: Day 28 of 72 of the Battle of Belgrade, Yugoslavia. MTO - Italy: US 12thAir Force provides air support for the Allied ground troops. MTO: US 15th Air Force B-17s and B-24s bomb targets in Austria, Yugoslavia and Italy. CBI - Burma: Day 194 of 302 of the Chinese Salween Offensive in Burma. CBI - China: Day 2,654 of 2,987 of the 2nd Sino-Japanese War. Day 178 of 259 of Japan's Operation ICHI-GO. PTO - Japan: US B-29s bomb targets on Okinawa. PTO - New Guinea: Day 302 of 597 of the Battle of New Britain. PTO - New Guinea: Day 173 of 481 of the Battle of Western New Guinea. PTO - Palau Islands: Day 27 of 74 of the Battle of Peleliu (Operation STALEMATE II). PTO - Palau Islands: Day 25 of 36 of the Battle of Angaur.